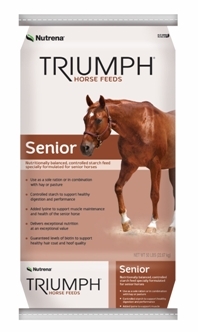 Nutritionally balanced, controlled starch feed specially formulated for senior horses. Use the feeding table as a guide for feeding Triumph Senior Horse Feed. Be sure to monitor your horse's body condition closely and adjust the feeding rate as necessary for the desired body condition and activity level. If your horse has no dental problems, feed clean, good quality hay at the rate of 1.0 to 1.75 lb (kg) of hay per 100 lb (kg) of bodyweight per day or the pasture equivalent. For horses who cannot consume roughage properly, feed Triumph Senior at a rate of 1.2 - 1.6% of bodyweight per day, in replacement of roughage. If your horse has severe dental problems, Triumph Senior horse feed may be soaked with warm water to form a mash. The mixture should soak for five to eight minutes until it reaches the consistency your horse prefers. Divide the recommended feeding level into two or more equally spaced feedings per day.